Plant a tree in memory of Virginia "Ginger"
Be the first to share your favorite memory, photo or story of Virginia "Ginger". This memorial page is dedicated for family, friends and future generations to celebrate the life of their loved one. 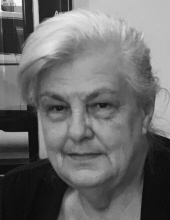 Virginia “Ginger” Cannon-Daby, 69, went home to our Lord on January 28, 2019, surrounded by her loving husband of 52 years, Rolland L Daby, her beloved sister, Carolyn Cannon, and her favorite people, her loving daughters, Tracey Briggs, Catherine Wood, Virginia O’Dell, Veronica Sarles, Carol Bishop, and most of her grandchildren.Born on November 1, 1949 in Poughkeepsie, she was the daughter of the late James and Catherine Cannon.Virginia adored and took great pride in her 18 grandchildren and 19 ½ great-grandchildren.She worked for two decades as a people’s advocate at Social Services and helped COUNTLESS members of this New York area. She had a huge heart and did all that she could for so many.In accordance with her wishes, she will be cremated with no public service as she wishes you all to remember her as she was.If you would like to make a donation to the Dutchess County SPCA in honor of her beloved kitty, “sassy”, nothing would make her smile more! Please send to the Dutchess County SPCA, 636 Violet Ave., Hyde Park, NY 12538 (www.dcspca.org).In our Mothers daily messages to us, she always signed off with “Love you, God Bless”.Arrangements are by Sweet’s Funeral Home, Inc., Hyde Park. To send an online condolence, please visit www.sweetsfuneralhome.com. To plant a tree in memory of Virginia "Ginger" Cannon-Daby, please visit our Tribute Store. "Email Address" would like to share the life celebration of Virginia "Ginger" Cannon-Daby. Click on the "link" to go to share a favorite memory or leave a condolence message for the family.